Omar Mohammed Omar of Hevron, a PA police officer, identified as terrorist eliminated on Sunday in the Damascus Gate attack. One of the terrorists who committed the attempted attack Sunday night at Damascus Gate has been identified as Palestinian officer Omar Mohammed Omar of Hevron. Omar is the third Palestinian policeman involved in attacks since the beginning of the current escalated wave of terrorism. 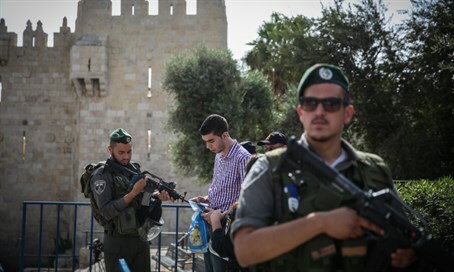 An initial investigation revealed that the two terrorists arrived at the Damascus Gate late Sunday night, where they started shooting at security forces who were in the middle of a shift change briefing. One terrorist was shot and eliminated, and the other attempted to flee. Security forces chased him down and he was shot dead as well. No injuries were reported among the Israeli police. The Damascus gate attack was the third attempted terror attack on Sunday. Earlier in the day, terrorists from the village of Jilazun opened fire at homes in the nearby town of Beit El in Binyamin. No one was hurt but a home sustained damage. Additionally, a female Arab terrorist was shot as she tried to stab a Border Police officer adjacent to Hevron's Cave of Machpelah.